The Premium models offer the unprecedented large-area light field with a light intensity of 80 lux. Under the main headlights are light striking LED dots, arranged in one or more rows. These are exclusively designed to signal other road users. Traffic regulations requirements are always met - even in day mode because the headlight is then dimmed to the minimum requirement of traffic regulations. Sidelights: Two of the signal LEDs take over the parking light function. Better than previous lighting solutions that are not aligned as signalling, but down on the road. I replaced a cheaper B&M light with this as the cheaper light didn't really have enough lateral spread of light and not enough light full stop. Quick and easy to fit, wiring simple: the spade connections are quite tight but that has to be a good thing. It has a second set of terminals for a rear light. I used it on a long two day from Edinburgh to London with lots of night riding and it gives a good safe spread of light. Once you get the inclination set it gives you enough distance vision to see what is up ahead and equally a good sense of the road surface immediately in front. The lateral spread is good too so in corners you are aware of the edges of the road. Thumbs up from me. Are the connectors compatible with a SP PD-8 hub? If not can you recommend a good quality compatible headlight unit for the SP PD-8 hub. Yes this is compatible, the hub requires bare wires. What Actually Does This Light Do? I don't understand the description under "Details". The first sentence is fine - the rest seems to be gibberish. Please clarify. Perhaps you should supply the original German - it may be clearer. 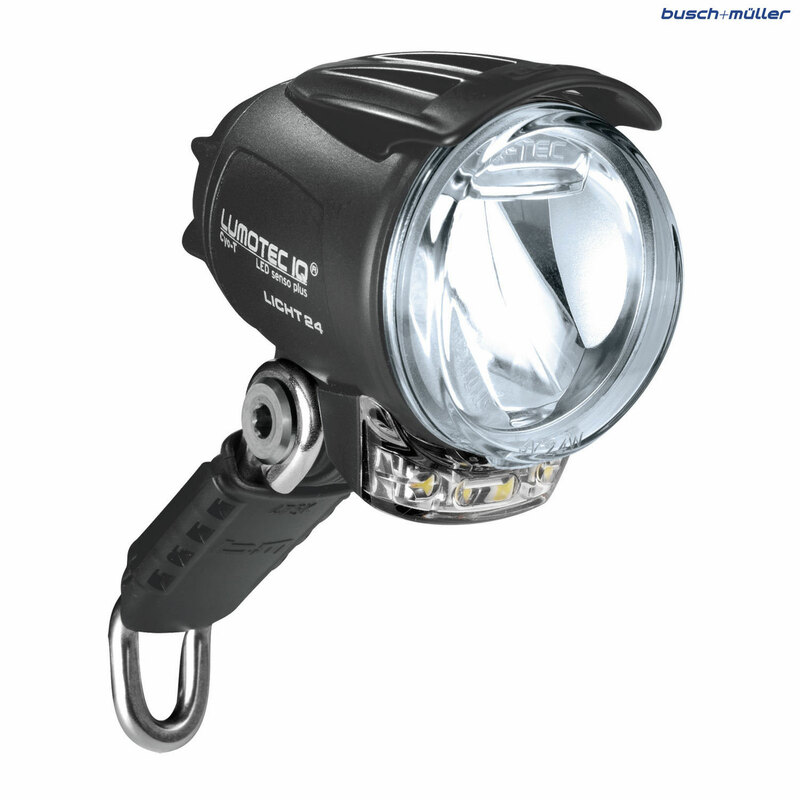 The important information is that there is an 80Lux output using B&M's IQ-Tec lens to give a bright well spread light. The lower mounted LED's in a row are specifically for the purpose of standing out to other road users especially from the side on. The light pattern has sharp cut offs to give maximum light onto the road surface. I have a Viking Keswick 2015 and would like to mount this light either onto the crown or the handlebars, in both instances which fittings/extensions would you be able to supply for this light? This light comes as standard with a bracket for fitting to the fork crown. Handlebar brackets are available as separate items and these are SJSC part number 33640.